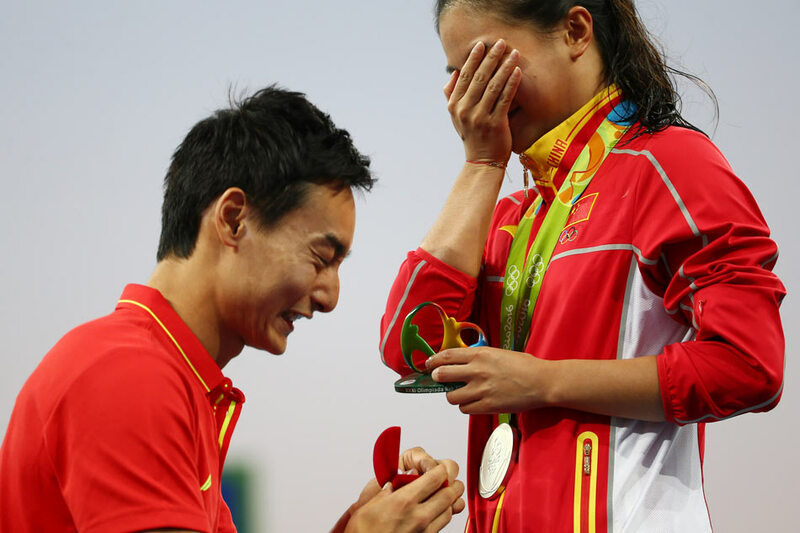 Chinese diver He Zi had a day to remember as no sooner had she stepped down from the podium than boyfriend and fellow Olympic medallist Qin Kai got down on one knee to propose. He grabbed silver in the women's 3m springboard Sunday, but Qin -- who won bronze in the men's 3m synchronised springboard last week -- won gold for bravery as he popped the question in front of a global TV audience. Thankfully, she said yes. "We've been dating for six years, but I didn't expect him to propose today," said He, proudly sporting the sparkling new ring. "He said a lot of things, made a lot of promises, but I think the thing that touched me the most is I think this is the guy I can trust for the rest of my life."